Like a very dry martini, with only a thought of vermouth and the memory of an olive to separate it from straight vodka or gin, English farce is only a heartbeat away from tragedy. So it is in Alan Ayckbourn's Season's Greeting, where a few comically sublime elements and a strategically placed backpack keep this farce from being a hopeless portrait of family dysfunction. It helps that Ayckbourn is an anthropological specialist in the behavior of the English middle-classes, thus providing the story with a well-considered selection of characters from this peculiar North Atlantic island species. Director Gavin Cameron-Webb mixes and matches his ensemble well, making the most of the playwright's dynamics. Borrowing a concept from American TV's All In The Family, which had run for almost a decade leading up to the 1980 premiere of this 26th of Ayckbourn's 70 plus plays, the playwright sets the action in the Bunker household. No, this isn't Archie's place, though Harvey Bunker, who lives with his son and daughter-in-law and their children, could pass for a close relative. Mike Hartman grounds Harvey in a gravelly voice and from there builds a crotchety and outspoken retired security guard who spends his days in front of the telly feeding his anxieties with old westerns and the "ambulance chasing" that passes for news, looking for a chance to use his own gun. In contrast, one of the household's regular Christmas house guests, Dr. Bernard Longstaff, is a milquetoast equally inept at his vocation (general practitioner) as his avocation (puppeteer). Paul Hebron's Bernard is consumed with details—which mercifully allows him to ignore his obvious failures, including his relationship with his alcoholic wife Phyllis—yet underneath it all, Hebron keeps us on edge, giving us the feeling that his doctor is perpetually on the verge of breaking down. Early on, Bernard bounces between Harvey and Harvey's daughter-in-law, Belinda, who's perched high atop a ladder, trimming the tree. If we had any notions that her commanding, bossy presence was a result of her elevated lookout, we're quickly dissuaded of this view when she dismounts. Kathleen McCall never breaks stride as her hyperbolic Belinda flits from one interaction to the next, reprimanding Bernard, serving her sister-in-law Pattie a drink, and ordering her husband Neville out for more supplies. Whether she's confronting her guests or falling head over heels for her sister Rachel's boyfriend, Belinda never does anything half way. While his domestic behavior has been toned down to minimize friction with his wife, Neville is no slouch, running a retail operation that is about to open its third store—and that's obviously where the sun shines for him in Sam Gregory's characterization. When Neville's not lit up over his budding commercial empire, Gregory shows Neville's knack for calculating risks in the details of his observations and his mechanical trouble-shooting. 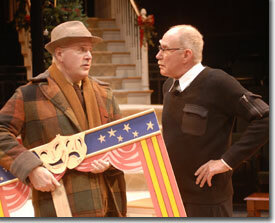 Like Hugh Landwehr's inventive meandering set, Ayckbourn's dysfunctional menagerie never ends. Neville's brother Eddie and sister-in-law Pattie are expecting their fourth kid, which neither of them wants. For Pattie, it will actually be her fifth, because Eddie eats, thinks, and acts like an adolescent. And Belinda's sister, Rachel, desperately clings to the notion that her arrangement with Clive, a successful first novelist, is something more than a writer-secretary relationship. The play's funniest moments, following Bernard's examination of a prostrate Clive, would have made for a perfect farcical ending; rather, we're left with Belinda's longing for what might have been, leaving us to conclude that next Christmas will bring more of the same. Only the English could end a farce this way. Perhaps it goes down best with a dry martini. Bottoms up! The Denver Center Theatre Company's production of Season's Greetings runs through December 23rd. 303-893-4100.